There are a lot of people who still have the old types of computer monitors hooked up to their computers. Not only are they heavy but they draw a lot of power and in effect aid in making your electricity bill high each month. Too, the old computer monitors do not come in the sizes and resolutions that modern movies and computer applications are designed to show at. If you are one of those persons with an old monitor, it is high time you stepped up to a lcd monitor. It is flatter than the old monitors and much lighter by far. In addition, they use less power to operate which translates into energy savings month after month. There are many brands and models of LCD monitors on the market now. 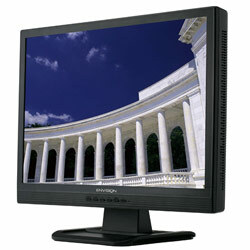 Some popular ones are the Samsung 2253LW 21.6″ Widescreen LCD Monitor, Envision G416 24″ Widescreen LCD Monitor (pictured above), ViewSonic NX2232W – 22″ Widescreen LCD Monitor w/ Built-in HDTV Tuner, Acer AL2216W – 22″ LCD Monitor, and BenQ G2000W 20.1″ Widescreen LCD Monitor. There are of course many more to choose from that are made by the same manufacturers and others like LG, SOYO, Acer, AOC, Navigon, Ergotron, and HP. If you are looking for bargain prices on these and other LCD monitors, Buy.com has a wide selection of them. Many of them come in different colors, so you will be able to find one that suits your taste and won’t break your pocket. Pickup your LCD monitor today and experience flawless movies and awesome gaming like never before.